Question: what do all these people have in common? Pope Francis; Princess Alexia of Greece; a Deputy Minister of Health; 1 Olympian; 30 patient groups; global IronMan athletes; 2 Latvian actors and Bayer Healthcare…? 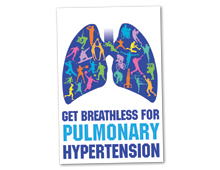 Answer: Zumba, marathons, flash mobs, skiing, swimming, kick-boxing, IronMan races and generally rallying together to ‘Get Breathless for Pulmonary Hypertension’ for World Pulmonary Hypertension Day (WPHD). For PH patients, every day is like an IronMan race. Forget triathlons, even the simplest everyday tasks like walking to the car or climbing the stairs can leave patients struggling to breathe. PH is a severe and life-threatening disorder that causes breathlessness, depression and, if left untreated, heart failure and death. It affects hundreds of thousands of people each year and yet remains relatively unknown. This is not your average awareness day. Armed with a common wish to address the lack of awareness, Pulmonary Hypertension Association (PHA) Europe, Bayer HealthCare and local patient groups around the world joined together, learned from each other and exchanged expertise to drive a WPHD frenzy that shook up PH social media and the world of sport alike. This campaign demonstrated excellent global reach. They took something (pulmonary hypertension) that applied to a small number and made it very ordinary for lots of people. Using great, creative ideas they delivered an impressive global campaign.